What steps do you take to keep yourself safe when riding? Perhaps you’re someone who wears hi-visibility clothing, or always uses hand signals when turning? Maybe you use lights year-round or consistently make eye contact with drivers. These safe riding practices are all tools in each rider’s saddlebag, and along with consistent, legal riding techniques, will keep us all safer. Another one of these tools is a bicycle helmet. While wearing a helmet will not singularly keep you safe, in the event of a crash, it does provide up to an 88% reduction in head and brain injury, and can very well save your life. We need your help this year-end because not every Maine family can afford to purchase a bicycle helmet for their child. The sad truth is that not every young bike rider can afford the basic equipment that helps keep them safe. We want to ensure that all children who are in need have access to high quality bicycle helmets and proper bicycle safety education, so they can develop a healthy, active lifestyle, and benefit from biking as a lifelong sport and mode of transportation. Your gift this year-end can help make this goal a reality. We pride ourselves on our effective and far-reaching education program. Through this program, we have distributed over 5,000 FREE helmets to children around the state at community events, schools, bike rodeos and health fairs. We have seized opportunities to educate young riders about safe bike driving and to properly fit them with a helmet. At the beginning of this year, we learned suddenly that the funding for our Helmet Program was no longer available. Historically, we have distributed over 1,600 helmets annually to children in need. This year, we found ourselves without the necessary funds to purchase helmets on the same scale as in previous years. Over the past 10 months alone, we have fielded requests from partners, schools and other organizations for over 1,000 helmets that we cannot fulfill due to lack of funding for the program. We need your help to revitalize our Helmet Program for 2017. It costs just $12 to equip a child with a helmet and educate them about how to ride their bicycle safely and legally. Your donation to this program will help protect some of the most vulnerable users of the road, and ensure that children can enjoy riding their bikes with the basic protective gear we take for granted. During this season of giving, give the gift of safer bicycling. Please make a year-end contribution today and help us reach our goal of $12,000, or 1,000 helmets that will protect the heads of the next generation of bicyclists. BANGOR, Maine – A Maine group that promotes bicycling says it’s noticed an uptick in the number of fatal crashes between automobiles and bicyclists and pedestrians in recent weeks. Three people have been killed in separate incidents since Oct. 10, bringing the total of fatalities so far this year to 11 – on pace with last year. The Maine Bicycle Coalition’s James Tasse says dangerous road design, distracted driving, and bikers and walkers not paying attention all play a role. “There are a lot of factors at play,” he says. “Just goes to show that our roads are dangerous places where people really need to be doing the best they can to look out for others in all situations.” Last year, a record 19 people were killed on Maine roadways while walking. Tasse says the coming months of fading daylight historically show the biggest upswing bike and pedestrian fatalities. People like to complain about young folks. But during and after BikeMaine’s visit to Lubec I received a lovely surprise. We had youngsters from the Lubec Consolidated School, the Campobello Island Consolidated School and the Cobscook Community High School Program helping throughout the BikeMaine Village — some with luggage and setting up and taking down tents, others with serving meals, and, of course, some as greeters and cheerleaders as the riders arrived. Adults riding with BikeMaine as well as locals working with the students took the time to tell me how wonderful the youngsters were — polite, respectful and always helpful. 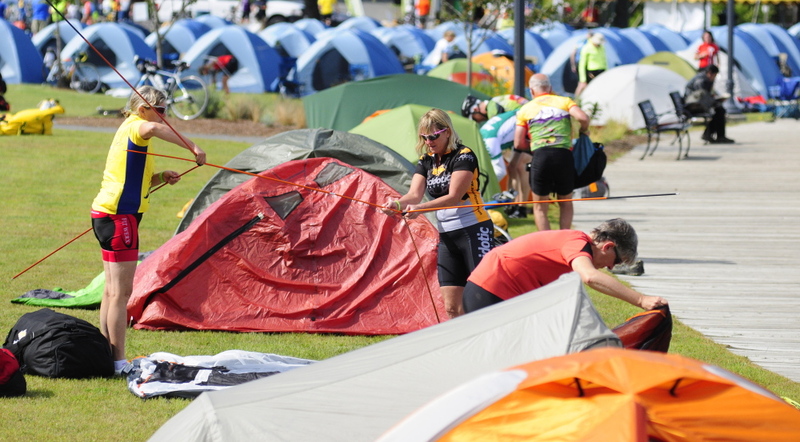 Watching their joy while setting up or taking down the tents, carrying luggage, serving dinner and breakfast and interacting with the riders showed what an asset they are to our communities. I send all the students who helped us a heartfelt thumbs-up for their wonderful contribution to BikeMaine’s visit to Lubec! Downtown Waterville will soon feature temporary curb extensions to shorten pedestrian crossings. It’s part of a two-part safety demonstration project organized by the city and the Bicycle Coalition of Maine. The first curb ‘bump out’ is expected to take place October 19th. Travel lanes of Main and Front streets will be narrowed to shorten the distance between sidewalks for pedestrians. Curb extensions will be temporarily added to the intersections of Temple and Front streets as well as Main and Appleton streets. “It allows pedestrians to come out a little bit further. They come out no further than a parking bay. So it’s not as if they’re standing in the street or anything. They’re completely within a safe zone and it just facilitates the visibility of that safe zone more and allows pedestrians to feel safer coming out,” said Sam Herr, Community Advocacy Coordinator for the Bicycle Coalition of Maine. The second demonstration project will take place on November 2nd. Both studies hope to show how inexpensive and simple it is to improve pedestrian safety as well as slow down traffic. GARDINER, Maine — The city of Gardiner is proud to announce it will receive a $12,300 challenge grant from the Bicycle Coalition of Maine to support the community’s ongoing bicycle and pedestrian projects, including the extension of the Cobbossee Trail. This is the first of a series of annual grants, funded by proceeds from the Coalition’s weeklong BikeMaine bicycle tour, that will focus on promoting bicycle and pedestrian safety and infrastructure in past BikeMaine host communities. After an in-depth review of previous BikeMaine communities, the Coalition decided to award this year’s grant to Gardiner to support the expansion of its Cobbossee Corridor. In 2014, Gardiner played host to more than 300 BikeMaine riders, staff and volunteers, closing Water Street for an intimate meal showcasing the culinary expertise of area restaurants, food from local farms, and providing camping in the scenic Waterfront Park. During a City Council meeting on Aug. 24, the Bicycle Coalition of Maine will formally award the grant to representatives from the city of Gardiner. The Bicycle Coalition of Maine is developing an online “Where to Ride Guide” that will seek to provide cyclists with a database of rides and destinations as well as bicycle-friendly businesses. The Maine Office of Tourism is providing $10,000 toward the effort. The office says the guide will be a “responsive website” that helps cyclists find out where they can ride and what businesses cater to bike riders. The grant is part of about $58,000 that the Maine Office of Tourism is giving to seven applicants as part of its Tourism Enterprise Marketing Grant program. By bill kitchen, Posted Aug. 04, 2016, at 12:29 p.m. The Bicycle Coalition of Maine and Bold Coast Coffee have teamed up for a unique initiative designed to promote BikeMaine 2016, support the non-profit’s mission, and to heighten awareness of Downeast Maine’s Bold Coast region. The program kicks off with the launch of a signature coffee, roasted and blended especially for cyclists and other sport enthusiasts. Fifty cents from every bag sold will go directly to the Bicycle Coalition of Maine, and all of the Bold Coast Coffee varieties will have a “BikeMaine Official Coffee” sticker affixed to the package to call attention to the event, as well as the organization. Additionally, the specially hand-crafted brew will be served exclusively to the 400 riders participating in the annual seven-day adventure as they make their way from Winter Harbor to Eastport and back again this September 10-17. The blend, part of their “Single-Origin Americas Series”, is a combination of Costa Rican, Mexican and Guatemalan beans with a unique range of roast profiles. It is especially crafted for both hot and cold brew. “We had to balance the elevated caffeine of a medium roast with the weight of a darker roast,” explained roaster Taylor Ackley. “It had to start fast and clean in your mouth, and yet hang around for a while, like the house guest you really don’t want to leave. And cold coffee, whether traditionally hot brewed and iced, or cold brewed, is exploding,” he added. “This blend is ideally curated for both methods, which is something quite new for the industry”. The showcase blend begins to roll out this week and will be available at retail outlets, gift shops, bike shops, and markets throughout the state, as well as online at www.BoldCoastCoffee.com. BikeMaine 2016 takes place September 10-17 along the Bold Coast Scenic Byway. Cyclists will travel an average of 55 miles per day for a total of 354 miles and almost 20,000 feet of elevation gain. Riders will overnight in six host communities including Winter Harbor, Millbridge, Jonesport, Machias, Lubec and Eastport. BikeMaine is an event offered by the Bicycle Coalition of Maine, a nonprofit organization with more than 5,000 members working to make Maine better through biking and walking. Over the past three years, BikeMaine has brought in over $1m in revenue to the state. Bold Coast Coffee is a small-batch specialty coffee roaster based in East Machias, Maine. Established in 2014, BCC crafts Maine Roasted™ single-origin coffees that are served and sold throughout New England and online.